Maschine Mk3 takes the essence of Maschine Studio, adds an audio interface and touchstrip, and packs it all into the optimal form factor for stage and studio. All-new audio interface and touchstrip. Stunning build quality and looks. No back legs for angling. 4D push encoder isn’t mixer-friendly. Each ofthe last three has its own particular ‘angle’ - Studio’s luxurious control surface and high-res colour screens, Mikro’s portability, and Jam’s 64-step sequencing - with the regular Maschine Mk2 sitting amongst them as the most ‘universal’ model, with its compact yet comprehensive design. Maschine Mk3 wants to change all that, bringing Maschine Studio’s ¬lagship feature – its fabulous screens - to the mainstream model, taking a couple of cues from Maschine Jam, and updating the hardware in general terms. We’d guess there’ll be a Maschine Studio Mk2 at some point, and hopefully a Mikro Mk3, but that’s entirely speculation on our part. With Maschine in Keyboard or Chord modes, it sweeps up and down the keyboard, again only playing the notes of held pads, or all of them if none are held. Notes and Perform modes are a lot of fun, but its in Pitch and Mod modes that the Smart Strip proves most useful. Overall, though, the new layout is a triumph, simplifying mode switching, editor access and more. 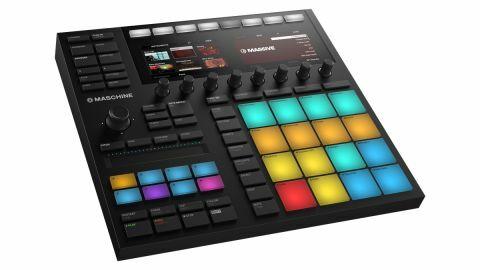 The only things missing in comparison to the expansive Maschine Studio are the dedicated Edit section (relieving the pads of their Shift functions) and the jogwheel - although the latter might actually be preferable to Mk3’s most controversial new feature: the four-directional push encoder. Maschine Mk3 represents the pinnacle of the series thus far - effectively Maschine Studio squeezed into a smaller case, with an audio interface and touchstrip rolled in, and a layout optimised for the software in its current form.